For anyone experiencing either of the following problems, please respond to this thread. Symptom 1: Incremental backup is unusually large or near the same size as the last full backup. If you have been either of these problems, please let me know via responding to this post. I am working with Symantec on this topic and need to get a consensus on how many are seeing this. Lots of data really has changed since last backup. Defragmentation has run between the time of your last backup and the current incremental. If either of the above is true then the large incremental is likely normal and not a problem. Computer crashes or other improper computer shut downs like power outage, etc. Here again if either of the above is true then this would not be a problem and would be normal. My testing and input from others has indicated these problems most typically occur on systems with multiple (two or more) hard drives and usually seem to occur on drives other than the C drive. Further if you have noticed problem #1 since about the last month or so and it was OK before that I need to know that as well. Have run checks on 2 of my systems - one XP and one Vista Ultimate, both running latest build of Ghost 14, and neither one is showing unusually large incremental backups. Thanks for running the test. It is apparent that unlike last year when the large incremental was really widespread and I googled and found MANY complaints on it, this time around it appears to be much less widespread. Note that they originally resolved the large incremental issue last December and then another new update was released around mid August and the large incremental started happening again on my system. I could literally go back and fortth between the two versions and recreate this problem ONLY with the new version. Just to clarify, does your system have at least two drives and was the test performed on drive other than C? Thus far I have never seen the large incremental issue occur on Drive C even on my system. Backups were on D drive on both systems which have 2 physical 250Gb drives each (set up as 4 partitions C thru F) with CD/DVD drives as G and H. Both also have access to a WD 2Tb NAS which I do a full back up of all my systems to on a monthly basis. This problem only seems to happen on drives other than C:. My C: drive incrementals are fine but when I attempted to do the same type of backup with external drives, the incrementals took as long and were as large as the full backups. Even though it said creating incremental backup on the screen and the file extension was iv2i. the two prior posts were done as I was typing this. What does all this mean if mdturner is not having the incremental problem but Allen and I are? Being a software engineer myself, I can assure you that is not strange at all. Though it may seem like something like this is black and white so to speak, when it comes to software issues there are actually many shades of gray. It is not at all uncommon for many to not see this problem and yet happen on other systems frequently. I would actually be surprised if everyone were seeing it. Symantec would have definitely put a TOP priority on it if it were that widespread because they would have had countless complaints. It does not mean there is not a software issue but the fewer people that are seeing it, the less inclined Symantec will be to pull out all the stops to resolve it. The whole reason for this thread is for me to try and get a streamlined sample and be able to go back to Symantec with. Let's see in time how many respond to this indicating they are seeing this problem. I forgot to mention all along that reconciliation was taking an abnormally long time when attempting the incrementals for external drives. Again, this was not true for my C: Drive. The whole incremental backup process only took maybe seven minutes or so including data verification. If you and I are the only ones experiencing the incremental non-c drive problem, then I doubt if Symantec will ever act upon it. At least you can revert to the prior version. I can't and that sort of leaves me stuck. I hope that there are enough of you out there who back up more than just your C: Drive (and who applied Live Update recently). Please let us know, we need to hear from you. Thank you. I have been checking these boards and it appears that only you and I have the incremental backup problem. Symantec will not act upon this if only two people have a problem. It would have to be quite a bit more widespread. So I will have to be satisfied with just using Norton Ghost 14 to safeguard my internal system drive. If you can guide me as to how I can thoroughly test NG14 for restoring my system drive, I would appreciate it. Again, I only have one internal drive (80gb) and do not wish to spend money for an additional one just for testing purposes, especially since I am far from handy when it comes to computers and would be very reluctant to take the cover off of my box. So if a system restore test can be accomplished via one of my external USB drives, please let me know. I think a second internal HD is one of the most useful things you can have in your computer. I'd rather have one than an external HD (even though I have both). Data transfer to an internal HD is three times faster than to a USB external HD. Installing an internal HD is a one minute job. And they are cheap. Get a mate to show you how. I have three external USB hard drives: 1TB (for backups), 500gb, and 150gb. With all that space, why would I need another internal hard drive, especially since my 80gb C: Drive has about 49gb free? I really do not care about data transfer speed. I am not handy with my hands and I feel totally illiterate when it comes to the insides of my desktop. If my hard drive crashed, I would need a Dell technician to come to my residence to install a new one. So are saying that I cannot test the system restore feature of Norton Ghost 14 using an external hard drive? If not, then I am very disillusioned. I know that Allen has used the restore feature many times but I am a newbie and do not trust the current version of Norton Ghost 14. Without having confidence in this product, I guess I'll have to eat my loss and search elsewhere for a more reliable backup/restore software. Too bad that Acronis did not give me any pre-purchase support. OK. You would like to test a restore. Restoring an image to a USB external HD from a Dell computer should work because there are no geometry issues. BUT, you will then have to remove your internal HD and replace it with the HD from the external enclosure. This applies to all imaging software. Get a few lessons about the insides of your computer. It really is easy. I'm not concerned at all about Ghost 14 image/restore. I've never seen that module fail and I've done dozens of Ghost 14 restores. I don't use Ghost 14 for Files and Folders backups or for imaging non OS partitions so issues with these modules don't frighten me. My only interest is being able to restore the OS partition in the event of OS corruption or HD failure. Other partitions are backed up differently. If you had a second internal HD you could restore images to that HD in a testing situation. You would not need to open the computer but you would need a boot manager to control which OS to boot. Internal HDs are so much more flexible than external. It may be easy for people in the know but I am not one of them. I would need to pay a professional to come and install a 2nd hard drive into my computer and, with money tight, just cannot see doing that. So I guess the bottom line is that I cannot test restoring my system with NG14. I am so sorry I ever purchased it. The name Norton/Symantec does mean a row of beans anymore. I am going to uninstall it for good. I want to thank you, Allen, mdturner, and some of the others here for trying to help. Don't get disheartened. You can do a "sham" restore. Well, it's not really a restore but it is the next best thing. Create an image of your OS partition on an external HD. Boot from the Ghost CD and Verify the image. If it verifies, it "will" restore. Your problems with Ghost are from using it in ways it was not intended to be used. Its main strength is image/restore of the OS partition. Ghost should serve you well. If your OS becomes corrupt, restore an image stored on your external HD. The computer doesn't need to be opened. I have a low threshold for restoring images. If an icon is the wrong colour today and was OK yesterday, I'll restore an image. It is a very useful app! 1) I can boot from my symantec recovery CD into a Norton Ghost 14 environment and see my stored recovery point sets (images). What do you mean by "Verify the Image"? 2) I do not see any where in the documentation where image-based backups are limited to the system drive. If Norton Ghost 14 was only intended to image system drives, then why does it allow other drives to be included in a full recovery point set? 3) If you are able to create incrementals of drives other than C: but I (and Allen) can't, then there is something wrong here which may be affecting a few users but not widespread. This makes me very uncomfortable because maybe there is some conflict with my computer which prevents NG14 from working 100% correctly. I was hopeful that Symantec might resolve the incremental problem. Now I can see that there is no problem to solve for most users and they will not address this for just Allen and myself. Again, I thank you for your time in replying and trying to be helpful. Boot from the Ghost 14 CD, Analyze, Explore My Computer, Browse to your Recovery Point (image), Select it, Verify. Imaging a non system partition is a personal choice. I think very few experienced image/backup folks who do it. First off I want to mention that I honestly believe Symantec will work on this issue. One of the reasons for this is the issue of unnecessary reconciliation which has been going on for a long time and IS more widespread. The reconciliation issue was present before the original large incremental issue (originally resolved last December) and was present afterwards up to the present day. The recent update re-introduced the large incremental for some people but obviously not as widespread as it was before the original fix last December. The second reason I think Syamntec will look into this is because they actually went to the expense a while back of sending me a thumb drive at THEIR expense (including shipping both ways) to get a copy of some of my backup images. A company typically does not do this unless they intend to work on the problem. Now having said that this problem will obviously not have as high a priority as it would if it were more widespread, but I do think they will work on it. I think we're going to have to be somewhat patient for a resolution though. Brian you stated: "Imaging a non system partition is a personal choice. I think very few experienced image/backup folks who do it." Brian, no offense but that is a personal opinion. I am an experienced computer expert and a software engineer of 20+ years and I absolutely do image backups of non-system drives. While I agree with you that the system drive is the most crucial one for doing image backups, image backups are not limited to this. I find that image backups of non system drives does not take long (provided you don't have an issue like this large incremental problem) and is very much comparable to doing a file based backup. Whether system drive or not, an image backup gives you the most precise image of your drive, no matter what type of drive it might be. The reality is that Ghost supports this and it should work properly. You should be able to do a test restore to an external drive. The trick usually is to get your computer to actually boot off the external drive. We can go into more detail through private message so we don't clutter the thread too much. I also agree with Brian that if you do a verify of your backup image through the startup CD, then that does confirm your image is sound and would do a proper restoral. As I mentioned if you really do want to actually boot from the external drive, it should be doable (provided your computer BIOS supports this) but it won't be as straight forward as booting from an internal drive. If you read the thread started by "joethejet", it appears that he might be having the same incremental backup problem. I will follow the steps you mentioned to do the "verify". I would still love to try and restore to an external drive and then boot my system from that drive. Prior to purchasing NG14, I was trying Farstone DriveClone Pro and restored my image to a usb drive. However, I got a blue screen of death when attempting to boot from the USB drive although I did go into my BIOS screen (F12) and chose external USB device to boot from. The problem might be that I did not know to backup the EISA partition. All I had backed up and restored was the C: Drive. I will converse with you via private message when I am ready to restore to the external. I would probably have to restore the EISA first and then the system partition. But we'll discuss how to proceed privately. Note that reconciliation is not a problem for me when running a C: Drive backup. It is only with the external drive backups where both the reconcilation and incremental problems exist. OK! I booted from my custom made Symantec Recovery Diskette and got into the NG14 enviroment. I followed your instructions and did a verify on the most recent iv2i. The result came back as valid. I then tried it on the 2nd most recent iv2i plus the original v2i and they all verified as valid. So I guess that is good news. Now if I were to actually need to do a restore, I would simply choose the most recent iv2i image, correct? Now if I were to actually need to do a restore, I would simply choose the most recent iv2i image, correct? Yes. It is that easy. Nothing difficult at all. It appears that joethejet is having a problem with incrementals also. The strange thing is that in jet's case, it appears to be his C: Drive backup which gives him full incrementals. I really hope that Symantec is addressing this. For what it's worth, my backup is in it's second day of reconciliation, on an incremental backup of drive D, stuck at 1%. It has worked fine in the past, last successful incremental backup 9/26/2009. That one was a bretty big increment, 5.8 GB on a 500 GB drive. Generally the increments were a few hundred MB or so. Since then, no joy, as they say. I've restarted the backup a few times, this time have let it run, but it's going nowhere. DId you just recently do a Live Update? When you defined the backup, did you set it to create a full recovery point the 1st time it is run in a new month or new quarter? i have seen the Sympton 3 week ago... i can't really remember. On Daily basis Ghost is doing every 2 hours backups of the System Disk and Data Disk, one time a day the Extended Data Disk. The last 14 days i have seen no problem. What I'm missing in your Threads are extended Information of your system? Which Version of Ghost do you use? Will this happen only if you use a scedule? What is the configuration of the scedule? How often do you have this problem? Have you restored your system before this Symptom happened? Have you manually consolidated or deleted unnessesary restorepoints? Is your Backupdrive an USB-Drive or a normal fixdisk? Are you using a raid-level for your Backupdrive? I have got an Ghost update on Sunday 13.09.2009. Have you got this problem after this date? Thanks but there is a history here you are not aware of. So what I'll say is this: 1) Last year there was a similar problem and it was resolved with a Ghost update in December with build 14.0.4.30167. 2) Sometime in August build 14.0.5.34587 was released which reintroduced this problem for some. I was the primary person working with Symantec which directly led to the Live Update in December which resolved this originally. The original issue last year was very widespread and with 5 minutes of online searches you could have found scores of people affected by this. This time around it is much less widespread but no less a problem. I am working directly with Symantec on this issue. I am a software engineer and computer expert and have been using Ghost for many, many years. This thread was started as a way of gathering information showing how many are affected by this so that I can provide that information to Symantec. In other threads I am helping people to ascertain whether similar problems they have are being caused by this issue or something else entirely. The symptom alone is not enough to say it is a problem with Ghost because as we know there are many valid reasons why an incremental can be almost as large as the Base. So this thread was not intended as a troubleshooting thread but rather started by me to gather statistics for Symantec. In short this problem tends to happen mainly for those who have multiple drives (I have 3 500GB internals + 2 1TB internal in Raid 1 for backup) and typically occurs on drives other than the C drive. The question I have for you is this: do you have your system up all the time or do you shut down your computer on occasion? Because that is the crux of this problem, that it does NOT happen unless you shut down your computer. For those who are powered up 24 hours a day, I am not aware of anyone who experiences a problem. For those who do shut down periodically, some experience this problem. Most typically the result is that the "vsnap.idx' file kept in the Root of each drive does not get updated consistently on drives other than C. This causes reconciliation to take place when it normally would not have to but does not in itself cause an unnecessarily large incremental image. But nevertheless the final result is that the incremental is almost as large as the base. Reproducing this problem on some systems is as simple as: 1) Run a full backup. 2) Immediately run an incremental and note that it is of normal size that you would expect. 3) Use the start menu and do a normal Restart. 4) When Windows comes back up, immediately go in and do another incremental. Now the incremental is almost as large as the original base completed only minutes before. Since you have multiple drives, might I suggest you do some tests with the above in mind? You may or may not have the problem because like I said this time around this issue is not nearly as widespread as the similar issue last year. But if you don't periodically shut your computer down you definitely would not see this. Then i have manually done some incrementels for drive D:, all are ok from size. I think, that there must be some condition coming true. I remember, that when it happened, Ghost didn't recognized the last incremental if you look to the management of the backup target. (sorry i'm german). But the incremental file was on the backupdrive. Yes under these conditions that would be normal, however not the case with this problem. This problem is very cut and dried and I can go back and forth between the previous version and the new 34587 build and the problems happes only with 34587. Symantec is fully aware of this, they have not pulled the update because the problem does not apear to be as widespread as the similar issue last year. I am not surprised that it is working for you. These kinds of problems don't often affect everyone. Being a software engineer myself I can imagine how many different branches there are within the code so there are probably multiple reasons why Ghost would do this. I hope this does not mean that recent purchasers of NG14 like myself will have to suffer with this "bug" just because of poor timing. Symantec should have some common sense and pull back to the previous version until they figure out what they did wrong with the current one. Obviously the prior version worked better than this one, or was there a problem with the prior version which the current one does correct? I sent you another PM. I am trying to work out something for you. Just to confirm a couple of things. I take it you have Ghost version 14.0.5.34587, correct? How many HD's do you have and which drives exhibit this problem? Do you notice this problem only after having shut down or restart the computer? What is your backup schedule like? How long in between the full and the incremental when you see the problem? Would you be willing to try one test for me? 1) If you do a full backup and immediately afterwards do an incremental, do you have a normal sized incremental? 2) After doing this, try doing only a computer restart (through start menu) followed immediately by another incremental when Windows is back up. Does this result in a large or normal incremental? You may have to try step 2 a couple of times. Just confirmed and that is the version of Ghost that I'm running. I have two HD's one internal, 250 GB, one external 300GB, the external is used for my backup and is the one with the problem. I had my incremental set for monthly, so yes I've obviously shut down and restarted my PC a number of times between the base backup up and the most recent increnmental. I'd be more than happy to try the test, I just did a base backup and I'm currently at 164.4 GB's of backup data, that includes the file backup and the full C:drive back up. I'm going to run the incremental again now and let you know what happens. Thanks. Ok, I just confirmed after running the full back up than the incremental that the file size has pretty much stayed the exact same. I'm going to restart now and run another incremental. I am a bit confused here so I want to make sure I understand. You said you have only two HD's and the external is your backup drive but you also said the external is the one with the problem. If I have this correct then I have a question. Are you running backups of your backup drive? If so, why if I may ask? You really should not do this. Your backup drive is the backup drive for "other" drives not for itself. In fact I don't know how you would not see anomalies conerning the size of your incrementals if you are backing up the backup drive. Yes, I have two drives one intenal and then the external that I'm using for backups. When I said the external is the one with the problem, I meant that the size of the incremental backup had increased to the point where I wasn't able to get any more than two recovery points on there and I really had not added anything additional to my C:. Unless I'm completely inept from a technical standpoint, as far as I know I am not running a backup of my backup. I just ran the incremental again after restarting and the size has not changed. You said the size of your incremental has not changed after doing the restart. Can you clarify what this means? So you have done two things: 1) created an incremental immediately after a full backup. 2) Performed a second incremental after doing a restart. Was the size of your incremental in step 1, of the size you would expect (very small)? How did this compare to the size after doing the restart? And did it in both cases create a file with a .iv2i extension (not a v2i)? Let me rephrase that, the size of the incremental did not change after I did the restart on my machine and ran the incremental again. It stayed the same size as it had before the restart. Yes, the size of the incremental in step 1 was the size I expected it to be, after the restart the size was same, here are the files that were created on my external. Your links are not coming through for me to look at. How are you attaching them? But it sounds like your incremental were normal in both cases which means that the problem probably does not happen 100% of the time after a computer restart or shut down. This is actually not surprising, my results indicated that I saw the problem about 60% of the time and I'm sure that number will vary from one system to the next. Allen, They need to be approved by the moderators before you can view them. Thanks, I should have expected that. No, it doesn't seem to hapen 100% of the time which is the part that concerns me. There is obviously some random event or trigger that causes it to happen. I guess the question remains is there anything that can be done about it? Not at the moment really. I have been working with Symantec on this but so far it looks like the percentage of people seeing this is petty low which means it will not be as high a priority for them as compared to if it was a widespread issue. I am sure your backup images are sound. When you have a larger than normal incremental it just means it is backing up data which is not really necessary because that "same" data is present in the base image. In the end the extent of this problem is that you end up with less room for incremental backups on your backup drive, but it does not change the integrity of the backup image. You might want to do a bit more testing to narrow down just how often you see this problem following say a computer restart or shutdown. I always approach this kind of thing on a case by case basis as sometimes it is easy to assume a Ghost problem when many times it is not. Many things can cause larger than usual incremental apart from the obvious adding a lot of data thing. Even defrag utilties can cause this. I am getting the sense that yours probably is a Ghost issue but in the end, the more controlled the experiment the more conclusive that becomes. This is why I asked you to run the tests earlier. If I run a backup job for any drive other than my c: drive after powering my computer on, NG14 always (100% of the time) creates an .iv2i which is almost as big as the full backup and the whole process takes even longer than the original backup since it goes through a time-consuming reconciliation. The only exception is if I run the same backup job two times without powering my computer down. The 1st one will be a "full" incremental like stated above but the 2nd one will be a true incremental (with a very quick reconciliation). This holds true even if I make some modifications to the external drive being backed up. As long as I do not power my computer down. Note: C: Drive backups always behave normally so the problem is with my external usb drives. I have the problem with an incremental stopping at 94 or 95% -- usually but not always the incremental file is created but the job never finishes. I've spent over 3 hours on the phone with Norton support in India; have done dskchk's, complete removal via NRT, re-installs etc. and the problem keeps coming back. After an initial backup, perhaps one incremental will run ok but the next one fails. And if you cancel the hung job and run a "missed" backup, it takes a long time and is huge but will usually complete. I'm ready to switch to a different backup program and will keep Ghost 14 just to be able to read prior backups. Ghost 10 worked ok on my machine (slow, but ok). I'm running XP Pro on an old Dell 8200 that only has 768kb of memory. However, Ghost 14 is about the only thing that has failed to run properly other than Roxio 10 which is a whole other story. Which version of Ghost 14 do you have? You can check this from Help:About. Did this problem start recently? 94-95% is an interesting place for the backup to hang. Do you have your backup job set to verify automatically? You can check this by selecting 'Run or Manage Backups' from the Tasks section. Then highlight the drive in question and select 'Edit Settings'. Walk through the pages by hitting 'Next' and on the second page is the 'Verify recovery point after creation' checked? If the Verify is checked it means that at 94% your backup is 100% completed and is in verify stage. In this case try one thing. Uncheck the 'Verify' option and see if the incremental completes normally. If this completes normally you can independantly check the integrity of the backup by clicking on 'Recovery Point Browser'. Then browse to your backup image and load it up. On the very top line on the left pane you can then 'Right Click' on the entry and select 'Verify Recovery Point'. I am curious if this will work for you. Also, when the incremental does complete do you get a file with a '.iv2i' extenstion or a '.v2i' extension? One internal HD: "C:" plus two hidden oem partitions: all three partitions defined within the backup job. Win/XP Professional SP3. One external USB attached drive for the backup destination. Within the backup job, new base created monthly, verify function is not selected. Before 14.0.5.34587, under normal circumstances my base backups were roughly 30GB (roughly 20 minutes to run) and the incrementals (Sunday, Thursday) about 2 to 3GB (worst case 3 minutes). After 14.0.5.34587, intermittently seeing incrementals as large as 26GB (50 minutes of which 20-30 was reconcile). I have eliminated the common suspects like improper shutdown/BSODs, defrags, etc. Have run chkdsk against C:... its clean. On average the computer is shutdown over night and restart the next day. (btw: I never put the pc into standby or hibernate). Just like we saw several months ago, VSNAP.IDX is not being updated during each and every shutdown. When it is not updated, the next incremental will be huge and vsnap.idx subsequently begins to get updated at shutdown. Until of course, the yet unexplained failure to update the file during a subsequent clean/normal soft shutdown. I appreciate the time and effort you're putting into this. Let me know if you have any questions about my setup. I'm currently running version 14.0.0.2815 but before you say Aha, it's an old version. I deliberately did not update it the last time I re-installed the program -- I've had the latest version installed several times and the behavior is pretty much the same. With the older version, I was able to cancel a 94% complete job and then run the incremental backup again and not have it tell me a backup was missed. Verify is not checked. The file extensions of the incrementals are .iv21. 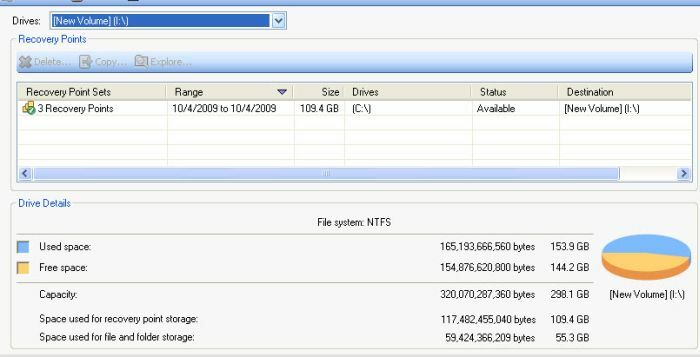 The base file is approximately 39GB, followed by sizes of 40mb, 4.3GB, and 33.6GB. I created the small incremental almost immediately after the base file. The 4.3GB file reached 94% fairly quickly and hung. I killed it and then the 33.6GB file completed successfully after running for 3 hours. Thank you for the information. One thing I do want to clarify though so I'll go back in time for just a moment. Last year a similar problem existed with large incrementals and it was resolved with a Live Update in December (version 14.0.4.30167) and then for some like us, reintroduced in 14.0.5.34587 sometime in mid August. However, before and after that time there remained an issue with unnecessary reconciliation which is related but also different. Both before and after that original fix in December there were many times that the vsnap.idx file would not get updated, particularly on systems with multiple HD's. When this file does not get updated it virtually guarantees reconciliation but does not necessarily mean that the incremental will be too large. The difference I observed was that before December this would almost always cause the incremental to be huge, but after December the incremental would be normal even though the vsnap.idx file was not updated properly. E.g., the end result is that the incremental would just take longer but would be normal otherwise. Now with this update in August, we are back to pre December symptoms. I will continue trying to work closely with Symantec on this issue. Thus far the issue has not appeared to be as widespread as the similar issue last year but perhaps that is starting to change, only time will tell.